There’s something significant that differentiates Pesach from other festivals. Because it’s very much centred around the home and family, not participating in a Seder means not participating along with the vast majority of Jews around the world and this can lead to a person feeling the separation from others far more acutely than at any other time. People who have left or are leaving the Charedi world also need space to work out their new relationship to Judaism, if they choose to have one and we felt a ‘secular’ Seder is a good step on that path. This issue came up in a recent Mavar board discussion so I suggested an event for our members so that they needn’t feel quite so disconnected – the No Seder Seder. 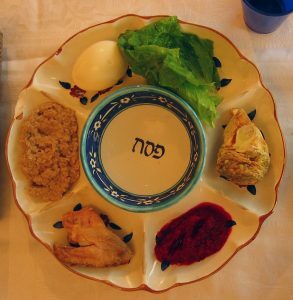 The idea was that we would have a Seder meal, with a Seder plate as the centrepiece of the table, traditions such as boiled eggs in salt water and plenty of matza and Charoset, but no Haggadahs, no service and no singing. Now that’s what I call freedom! The idea came up close to Pesach as part of Mavar’s general plan to provide more social events for our Charedi and ex-Charedi members, and our gathering was small, but delightful. We ate and chatted late into the night, in fact our No Seder Seder finished later than my family Seder the previous evening! Next year we’ll hopefully do it again, and with more notice perhaps we’ll enjoy a bigger and just as delightful evening.